What to Eat Instead of Pasta – And Save Time! If I had a pine nut for every time I heard this… well, I’d be making pesto right now! But if you find yourself stuck for what to eat instead of pasta, I am here to prove that eating healthier can be quick. First of all, why is pasta so bad for us? Pasta is made from refined flour – finely ground wheat or other grains. These grains can irritate your gut, causing symptoms such as bloating, constipation and gas. Grain flours are primarily starch – and starch is basically sugar. Sugar is absorbed quickly and can raise your blood sugars rapidly. Your body reacts to lower your blood sugar, storing the excess in fat cells. This means you store extra fat and get that slump that I refer to as ‘carb coma’. Although ‘whole wheat’ pasta includes the fibre of the original grain, this fibre also contains natural chemicals that can irritate your gut and interfere with nutrient absorption. It can even leach essential minerals from your body. Refined grain products have less nutritional value than more natural foods. So, although you may feel (often uncomfortably) full, your body is still feeling starved of vitamins, minerals and other essential nutrients. Over-using grain products can lead to food sensitivities, damaging your gut and depleting digestive enzymes. This can lead to a myriad of health problems, from digestive disorders to chronic fatigue, celiac disease and other auto-immune diseases. ‘Bulking up’ meals with pasta often means we don’t reach our target portions of fresh veg and fruit per day – and most of us could do better in this department! If you often just grab the pasta pan because you’re tired, busy and can’t think of a quick alternative, my challenge to you is to watch my video that PROVES there is a simple alternative that is quicker. Here is the link to the quick and easy Instant Pesto Zucchetti recipe showcased in the video. They are antioxidant powerhouses! Packed with Vitamin C as well as a good amount of Vitamin A. They also boast some more exotic antioxidants like the carotenoids lutein and zeaxanthin, which are especially helpful in protecting eye health. They are a very good source of potassium, helping to reduce blood pressure and heart rate by countering the effects of sodium. This makes it a very helpful choice for people with high blood pressure and heart conditions. They are also a good source of the B Complex vitamins B1, B2, B6 and minerals such as iron, manganese, phosphorous, zinc and potassium – essential for so many body functions, from the formation of healthy cells to transporting oxygen through the body to forming healthy bones and teeth. 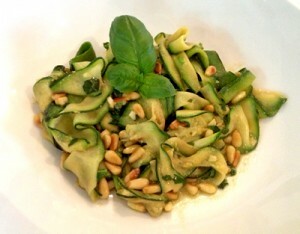 Has this encouraged you to try Courgette/Zucchini ‘Pasta’ instead of regular pasta? Please leave a comment!